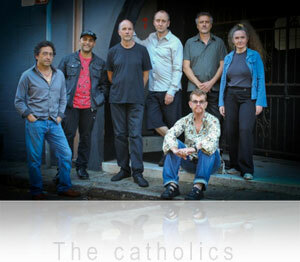 The catholics are one of Australia's most distinctive contemporary groups. 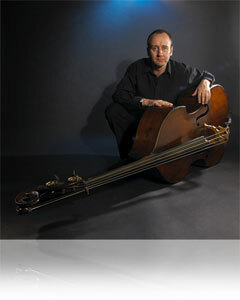 Their leader, composer and bassist, Lloyd Swanton, is well known across Australia and internationally for his work with improvising legends The Necks, as well as appearances on over 100 albums, many of them ARIA Award winners, for artists including Vince Jones, Wendy Matthews and Bernie McGann. With The catholics he has assembled some of the best musicians in Australia from a wide spectrum of musical backgrounds to produce one of the freshest-sounding new acts in a long time. Formed in 1991, their personnel comprises: Sandy Evans - saxophones, James Greening - trombone and pocket trumpet, Jonathan Pease - guitar, Gary Daley - piano accordion and melodica, Hamish Stuart - drums, and Fabian Hevia - percussion. Throughout The catholics' beautifully crafted and instantly accessible pieces runs a strong, seductive dance strain found in the band's various African, Caribbean, Latin and Eastern influences. This 7-piece ensemble is one of Australia's most popular jazz acts and has performed across the nation to great response. They have won a Mo Award for Best Jazz Group, and three of their eight acclaimed albums have been nominated for ARIA Awards. The catholics have made big waves outside of their home country too, with releases of several of their albums in North America to critical acclaim. The release of their album Simple in Europe earned them a nomination for the Deutsche Schallplattenkritik Award. Overseas performances have included tours of Canada and Europe, and concerts in Thailand as part of the King of Thailand's Silver Jubilee celebrations. By taking the catchiness of pop music, and combining it with infectious dance rhythms of the world and indisputably authoritative jazz blowing, The catholics are creating a rare thing indeed- a sound with an instant appeal, physical excitement, passion, and critical credibility. Says Swanton: "The bottom line for me is that people who come to see a catholics show can enjoy us intellectually or emotionally, or they can just get up and dance." "An outstanding and imaginative Australian bassist and composer"
Bassist, composer, producer, bandleader and radio presenter, fifty eight year-old Swanton is one of the most respected and in-demand musicians in the country. Apart from leading The catholics, and co-leading improvising legends The Necks, he has performed with many of the cornerstones of Australian music: Clarion Fracture Zone, the Bernie McGann Trio, Vince Jones, the Dynamic Hepnotics, Tim Finn, The Benders, Stephen Cummings, Wendy Matthews, Sydney Symphony Orchestra, the Alister Spence Trio, Gyan and Michael Leunig, Paul Capsis, Phil Slater Quartet, The Vampires and The Mighty Reapers, to name a few. Lloyd appears on over one hundred albums, has produced four ARIA Award winners with Bernie McGann and two with The Necks, and has played on many others. With The Necks he is also winner of three APRA Awards, and two Australian Jazz Awards. Lloyd's other album production credits include The Vampires with Lionel Loueke, and Phillip Johnston's Coolerators. He is a three-time winner of Best Bassist in the Australian Jazz and Blues Awards, and with The catholics, has won the Mo Award for Best Jazz Group. His score (with The Necks) to the highly acclaimed feature film The Boys was nominated for an Australian Film Institute Award, as well as an ARIA Award for the soundtrack album. His score to the short film The Beat Manifesto was a multiple award winner. Over one hundred of his compositions appear on albums by some of Australia's most respected names. Lloyd teaches, has given masterclasses at institutions throughout Australia, and for fifteen years hosted "Mixed Marriage", a very popular weekly show on Sydney's Eastside Radio 89.7, which looked at crossings of jazz with other musical styles. Swanton’s work “Ambon", a major suite of compositions for a twelve-piece ensemble (which was drawn from the secret prison diary of his uncle, who died a prisoner of the Japanese in World War II) premiered to great acclaim in 2015 and a double CD studio recording of the work was also released that year. In his spare time, Lloyd is an avid follower of the game of Australian Football, and a keen collector of Australian Aboriginal art, ice crushers, modernist ceramics, and books on Fellini. He also gathers historical information on his distant relative Theodore Deck, a leading name in 19th Century French ceramics. "... this saxophonist surely ranks as one of the best contemporary jazz composer/musicians anywhere." A founding member of The catholics, Sandy is dedicated to composing and performing contemporary improvised music. Her passion and commitment to this artform has continually evolved since her early career, when she led her own group Women And Children First on a revolutionary seven-month trip around Australia in a bus, performing in many remote areas of the country. She currently leads the Sandy Evans Trio and Sextet and is a member of Ten Part Invention, the Australian Art Orchestra, Waratah, austraLYSIS, MARA! and Friends of Kim Sanders. In GEST8 she renews her creative partnership with Tony Gorman. Along with Gorman and Alister Spence, she was co-leader of the internationally-renowned Clarion Fracture Zone. Sandy is in demand as a composer and has received many commissions from ensembles in which she works. She is renowned for her composition Testimony about the life and music of Charlie Parker, commissioned by ABC Radio Drama. Testimony was performed by The Australian Art Orchestra at The Sydney Opera House as part of The Sydney Festival in 2002. Sandy has a keen interest in Indian classical music and collaborates regularly with Indian musicians Guru Kaaraikkudi Mani and Sruthi Laya, and Sarangan Sriranganathan and Bobby Singh. In 2014 Sandy was awarded a PhD from Macquarie University, researching Carnatic Jazz intercultural music. She received a Churchill fellowship to continue her research in India. In 2010, Sandy Evans was awarded an OAM for services to music. She has won many awards, including the inaugural Bell Award For Australian Jazz Musician of The Year 2003, a Young Australian Creative Fellowship, APRA Award for Jazz Composition of the Year, two Mo Awards and three ARIA Awards. Sandy is a lecturer at the Sydney Conservatorium of Music and the University of New South Wales. One of Australia’s leading jazz trombonists, James Greening has been widely praised for his work with such leading ensembles as Ten Part Invention, Wanderlust, The Umbrellas, Australian Art Orchestra, and his own ensemble, The World According to James. Born in Newcastle, NSW, James’ early experiences included the Newcastle Police Boys Band, with which he toured Europe and Australia. While studying jazz at the NSW Conservatorium, he began working with both modern and traditional jazz bands around Sydney. Through the 1980s, James developed his distinctive sound and style while working with a broad range of jazz ensembles, Latin and R&B bands, orchestras and television showbands. In addition to the groups mentioned above, he has also worked and recorded with Bernie McGann, Mike Nock, Chris Cody, Steve Hunter, Monica Trapaga, Vince Jones, Judy Bailey and James Morrison. Of particular note over some twenty years, James played extensively with the late great Jackie Orszaczky, in numerous groundbreaking bands such as Jump Back Jack, Industrial Accident, The Godmothers, The Orszaczky Budget Orchestra and Hungarian Rapsadists. A member of the Australian Art Orchestra for over fifteen years, major projects have been Sandy Evan’s Testimony – a tribute to Charlie Parker performed at both Sydney and Melbourne Festivals, and Ruby’s Story and Kura Tungar: River Songs and Stories – a collaboration with indigenous performers Ruby Hunter and Archie Roach. Also with the Australian Art Orchestra, James performed in India and featured on the ARIA-nominated recording with the Sruthi Laya Ensemble, Into the Fire. James has performed with many international artists including Billy Harper, Mark Helias, Terumasa Hino, the Maria Schneider Big Band, Charles Mingus Tribute Big Band and Lou Reed. James teaches in the Jazz Department at the Australian National University and has been working in the Musica Viva In Schools program since 1992. With The World According to James, formed in 1992, he steps forward as a bandleader and composer, presenting music with all the qualities of wit, creativity and exuberance that have long been associated with his work as a soloist. The ensemble has released three albums, with Way Back having been nominated for an ARIA Award, and Lingua Franca winning an AIR Award. James is one of three founding members of The catholics, and in recent years has brought the pocket trumpet to the band's instrumental palette. A member of The catholics since 1994, Chilean-born Fabian Hevia migrated to Australia in 1975 and studied at Wollongong University and the NSW Conservatorium of Music. Notably, Fabian combines considerable authority on the major Latin American percussion instruments with solid institutional study. Fabian has toured, recorded and performed with many Australian and international artists including James Morrison, Don Burrows, Carl Orr, Marc Ribot, Don Harper, Wanderlust, Lonnie Liston Smith (USA), Budi Assad (Brazil/USA), Steve Hunter's 9 Lives, Vince Jones, Lily Dior, The Mighty Reapers, Barney McAll, Kevin Hunt, Jonathan Zwartz and Chris Cody. He appears on ARIA Award-winning albums by Wanderlust, Jimmy Little, and Karma County. Fabian performed in the theatrical production Birth of the Cool, which premiered at the 2003 Sydney Festival, and subsequently performed seasons of the show in Europe. Hevia's considerable international touring includes performances at major festivals and venues in Europe, Canada and Japan. He also works extensively in television, and as a composer was nominated for an APRA Award in 1996. In 2014, Fabian worked as a cast member on Russell Crowes' film, The Water Diviner. 2007 brought a prestigious highlight to Fabian's career, performing with the Oscar Castro Neves band which featured among others, Airto Moreira & Alex Acuna. Fabian is currently leading his eclectic ensemble Far Beyond, and since relocating to Adelaide is involved as Musician in the Class Room with Musica Viva. Jon Pease was born in Swaziland, Southern Africa, and spent a significant period of his youth in the UK, before emigrating to New Zealand in 1978. He studied classical guitar with English guitarist John Mills at the Nelson School of Music, before becoming a founding member of acoustic guitar orchestra, Nigel Gavin's Gitbox Rebellion. In 1991 he moved to Australia to study jazz at the NSW Conservatorium of Music and has lived in Sydney ever since. Since 1993 he has been a part of the Musica Viva Schools programme, touring throughout Australia and South East Asia. A member of The catholics since 2000, over the years Pease has worked with Danielle Gaha, Deep Lounge, Darren Percival, The World's Klang, Monica Trapaga, Mano a Mano, Paul Jarms, Nikki Doll and Hummin' Bein'. Currently he is performing with The Resurrectors, Imbosima, Dereb Desalegn, Steve Clisby, Declan Kelly, Paul Mac, Denys Mason, The Hipstones and the EON Beats Project. Gary Daley is a highly regarded performer, composer and teacher from the NSW Blue Mountains. He plays accordion, melodica, piano and organ and is best known as a performer with some of Australia’s elite jazz and world music ensembles and artists. Currently he is a member of Greening From Ear To Ear (James Greening), Fabian Hevia’s Far Beyond project, and Galaxstare. Having been a fixture on the Sydney music scene for over 20 years, he has performed, recorded and toured with a plethora of artists in a variety of contemporary genres. Gary is the recipient of two Australia Council grants, for new work and recording. These resulted in his large instrumental project Sanctuary, from 2010, which received rave reviews and enjoyed a string of highly successful performances as well as a CD release in 2012. He appears on many albums and has performed at most venues and major festivals throughout Australia as well as touring internationally, and has played on TV and movie scores. He also appears on ABC Television in the very popular children’s series “Lah Lah’s Musical Adventures” and tours extensively with Lah Lah’s Big Live Band. Gary leads his own band, Bungarribee, featuring his compositions as well as improvisations on gems from the classical repertoire. He also performs in several outstanding duos with exemplary musicians such as reeds player Paul Cutlan and mandolinist James Daley ( Gary’s son). Gary is artistic director for the acclaimed Blue Mountains arts collective, Live at the Village, which has been presenting premiere Australian and international artists for almost a decade. Hamish Stuart is the #1 drummer of choice for too many top-name pop and rock acts to mention, but he also has extensive credentials in jazz and roots music. A catholics member since 1997, Hamish has a long working relationship with the legendary Jackie Orszaczky, playing in most of his many ensembles over the last two decades. As well as his commitments with Orszaczky, Stuart currently performs and records with the Andrew Robson Trio, Tina Harrod, and Informal Troupe. He has also performed and recorded extensively with the Mighty Reapers and Barney McAll. Hamish has toured Europe and Asia with numerous acts, and international artists whom he has accompanied in Australia and overseas include Billy Harper, Jon Cleary, and John Stubblefield. In 2010, Hamish released his first album as a leader, Someone Else's Child. Over the years, many of Australia’s best musicians have played with the band. The full list is below.